Friends enjoy nordic skiing on the Jim Whisenhant Cross Country Ski Trail system at Birch Hill Recreation Area in Fairbanks. Photo courtesy State of Alaska Tourism / Matt Hage. Fairbanks offers great wintertime fun and outdoor recreation. We’ve rounded up some of our favorite outdoor activities for you to spend a day in the elements. Whether you go out to ski, snowboard or snowmobile, the Fairbanks Princess Riverside Lodge is the perfect spot to relax with a hot drink and put your feet up at the end of the day. Fairbanks has miles of maintained trails for you to pull out your sled and shred some serious powder. The Fairbanks Snow Travelers snowmobile club offers group rides throughout the winter season and their website provides information about riding in the area, snow and weather conditions, as well as riding tips. The White Mountains National Recreation Area has more than 200 miles of maintained trails and the Chena River Recreation Area provides snowmobile access to back country trails and cabins. Mount Aurora Skiland is a ski and snowboard park with terrain for all skill levels. In celebration of its 50th season, the ski resort is offering the same ticket prices as the previous year. Ski and snowboard rentals are available as well as one and multiple day passes. Pack up the family and head to the hills for some downhill skiing and snowboard fun. Moose Mountain is an intermediate and advanced alpine park for skiers and snowboarders looking for more technical terrain and1,300 feet of vertical drop. Fairbanks is known for being cold in winter, but Moose Mountain is an ideal place to spend the day on the slopes, with weather usually 20 to 30 degrees warmer than in town. 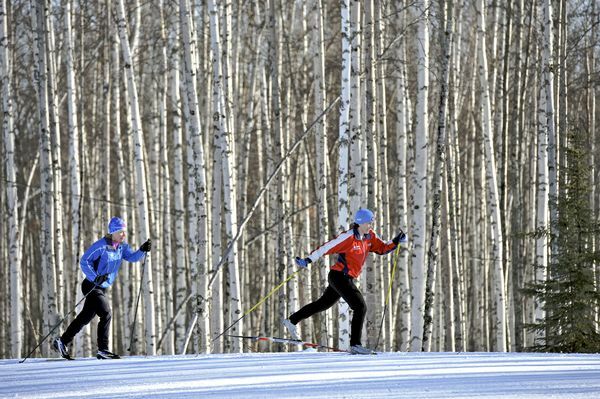 The Nordic Ski club of Fairbanks supports and maintains more than 30 kilometers of skate, classical and lighted loop trails at the Birch Hill Recreation Area. The area is fee free and open to the public. The club offers race events, programs and classes during the winter season for beginner and advanced Nordic skiers. It seems that running and snowshoeing might not go hand in hand, but the Fairbanks Running Club North, offers competitive racing events year-round, some that require shoes and others snowshoes. If you’re looking to keep your racing edge in the winter months, check out upcoming races like the Heart of Darkness Snowshoe Race, Solstice Snowshoe Shuffle, Turkey Trot and the 25th George Bloom Memorial Midday Sun Fun Run. Despite all the snow, there is great hiking in Fairbanks for those willing to brave the elements. The Chena River Recreation Area offers miles of maintained trails with panoramic views for leisurely walks or brisk winter runs. The White Mountains National Recreation Area, a one million acre park, has more than 200 miles of groomed trails and 10 public use cabins for winter adventures. Go for a couple hours or spend a couple of days, but be sure to pack warm gear, be prepared for changing weather conditions and let someone know your plan before leaving home.